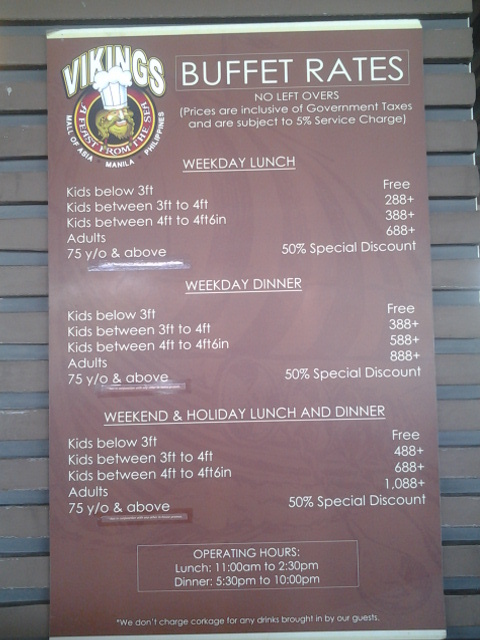 Vikings MOA (Mall of Asia Review) You Really Wanna Eat Here?! Call Vikings MOA’s contact number for reservations (see number below) and avoid falling in line outside of the restaurant. Unless you want to feel like someone waiting for a food ration because of food shortage while drooling at people eating inside! Torture! Even on a simple Monday Lunch, the place was full! I wasn’t expecting that, but lesson learned. Checkout my video to see how much time we spent waiting. Don’t forget to bring an ID with the birth date of the birthday celebrant if you are availing Vikings MOA birthday promo. Comparing with my experience in DAD’s Ultimate Buffet, more “fun” to celebrate birthdays here. After trying several eat all you can buffet restaurants, I’ll be raising my standard a bit. So if previously I might have rated a restaurant good on certain factors, now you’ll be seeing more “need improvements”. So let’s get it on. Honestly, I feel Vikings is over rated. Using the word “Luxury” in their advertising and with their high rates, I was expecting a lot. But I’m afraid, with their current price rate, there’s really nothing extra ordinary on the taste of the food and the number of food selection they have. I haven’t tried other branch yet. 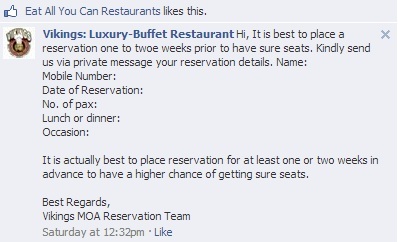 This review is specifically for Vikings MOA branch where we had our Monday lunch buffet. And I haven’t tried their dinner buffet (whether they serve more menu during dinner or not, I don’t know… maybe I’ll update this when I have the chance to eat here during their dinner buffet… God willing ). With the price and selection of food, I feel that DAD’s Ultimate Buffet is still better because you actually have three restaurants that serves you (i.e. Dads, Saisaki and Kamayan). I didn’t bother to count the menu of these restaurants and performed detailed comparison lol, it’s just my gut feel. Just drop a message if you have a detailed comparison and I’ll be more than happy to include it in this review. Their band is more entertaining. Dad’s band are more on delivering good music. Vikings is more on customer engagement by encouraging you (especially the birthday celebrant) to have fun with the performers. At first, when I heard them sing, I said “their just shouting!” Dad’s is better… then I realize… shouting??? Ofcourse Chazper! This is SPARTA! Este VIKINGS! It’s suppose to be loud and fun like Vikings did in the old days. So if your friends are game/cowboys/fun or even bored, it’s worth the experience to celebrate a birthday here. Here are the foods that I don’t find yummy. Note: I wasn’t able to taste all the food… so this doesn’t represent the whole menu of Vikings MOA. Baked Oyster. It wasn’t that cooked… not what I was expecting. If it was baked, at least it should have been a little cooked right? But it was only the toppings (quick melt cheese) that was cooked. But then again, maybe I just don’t like oysters in general. Be careful in eating this, if you have a weak stomach! Grilled Class A Batangas Tenderloin and Roast Australian Lamb Steak? What gives?! You need to fall in line and ask the crew to give you a piece of these two special meat. I didn’t find anything extra ordinary if compared to an ordinary beef. I got sick (diarrhea with vomiting) that Monday night and fever Tuesday night (actually Wednesday early morning) so my wife accompanied me to Medical City for a checkup. From the lab results it shows that I had a slight bacterial infection. I didn’t take the antibiotic prescribed by the doctor ‘coz my fever already subsided that morning. Maybe my regular intake of garlic capsule helped in a way because of its antibacterial properties. Now, is it from Vikings MOA or from other things that I ate or places I visited over the weekend? I really don’t know. I don’t want to make conclusions, I’m just stating what happened. To give credit, they do advise customers to really be careful in eating raw food. But I didn’t eat any raw food (except for the baked oyster which wifey also ate) so I’m pretty sure it wasn’t raw food or sea food that caused my unprecedented experience in this eat all you can Vikings review. What Do People Say About Vikings on Twitter?